Where on Earth are the Spratly Islands and Why Should We Care? With the world news focused on wars in the Middle East wars and the plight of more than 50 million displaced people, highest since World War II, we tend to pay scant attention to a few disputed reefs in the South China Sea. But this sea and what’s above and below those reefs are more important than you may think. First, this is the geographical meeting place where Southeast Asia’s 600 million people converge with China’s 1.3 billion people and the Indian subcontinent’s 1.5 billion people. The South China Sea is the throat of the Western Pacific and Indian Oceans, where sea routes merge. More than half of the world’s annual merchant fleet tonnage passes through the choke points of the Malacca, Sunda, Lombok, and Makassar straits. When Gunter and I sailed through the Malacca Strait, the most dangerous in the world, we were astonished to learn that the oil transported through that strait was triple the amount that travels through the Suez Canal and fifteen times the amount that transits the Panama Canal. Last week, while researching the Asian section of “The Long Way Back,” I learned that approximately two thirds of South Korea’s energy supplies, nearly 60 percent of Japan’s and Taiwan’s energy, and 80 percent of China’s crude imports come through the South China Sea. Second, more important than its location, is the fact that this area has proven reserves—lots of it—seven billion barrels of oil, as well as an estimated 900 trillion cubic feet of natural gas. China calculates that this sea will eventually yield 130 billion barrels of oil, more than Saudi Arabia! A second “Persian Gulf” in Asia could overcome the need for oil to pass through the dangerous Malacca Strait. A third reason why the South China Sea is important is that it is on its way to become the most contested body of water in the world. Countries lining the South China Sea are scrambling for territory and power. Anyone who speculates that with the onset of globalization, territorial disputes have become “so last century” should observe what is happening here, where geography is destiny.” Just maybe Mark Twain was right in quipping “God created war so that Americans would learn geography.” The South China Sea is home to more than two hundred small islands, rocks, and coral reefs—only about a dozen of which are permanently above water. Yet the geostrategic importance is significant. 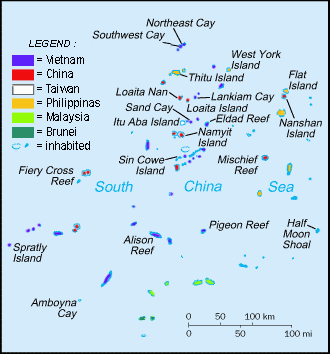 Take the Spratlys, with significant oil and gas deposits, for example: These reef islands are claimed in full by China, Taiwan and Vietnam, and in part by Malaysia, the Philippines, and Brunei. China has built concrete helipads and military structures on seven reefs and shoals. On Mischief Reef, China has constructed a three-story building and 5 other military structures. On Johnson Reef, China put up a structure armed with high-powered machine guns. On other reefs, Taiwan, Vietnam, Malaysia and the Philippines have naval structures, runways, piers, and storage tanks. See figure 1. FIGURE 1: Spratly Islands military settlements by countries claiming rights. China’s maps dating back centuries (see figure 2) claim a historic nine-dash line, or “cow’s tongue” looping the entire South China Sea from China’s Hainan Island 1,200 miles south to Singapore and Malaysia. All of these weaker, littoral states are more or less arrayed against China and dependent on the United States for diplomatic and military backing. Conflicting claims will only increase; energy consumption in developing Asian countries is expected to double by 2030, with China accounting for half of that growth. 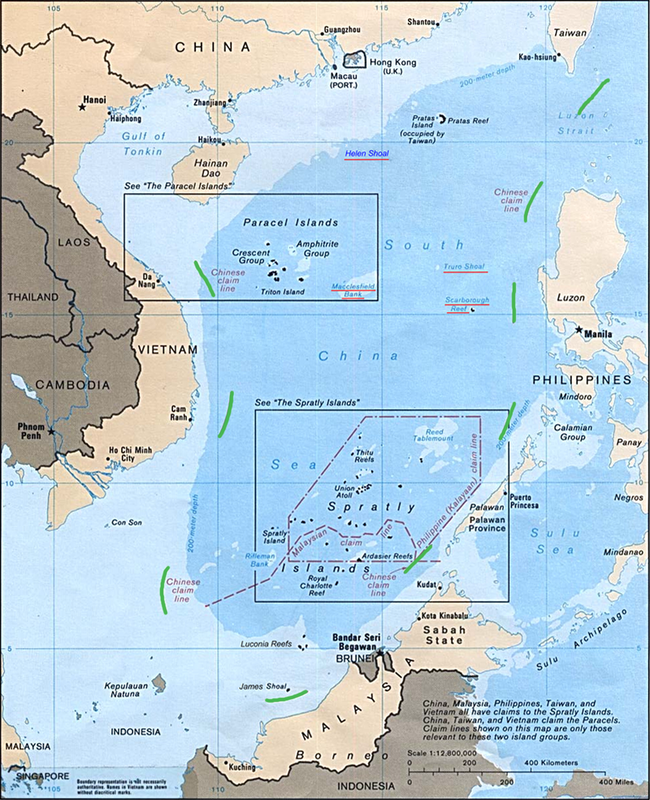 FIGURE 2: The nine-dash line, or tongue, (highlighted in green) of the South China Sea claimed by China but disputed by others. China has built dredged platforms with runways long enough to land her jet fighters and has been declaring maritime sovereignty in the area for some time. Under President Xi Jinping, China wants to break an American circle of alliances that reaches from the Korean peninsula through Japan and the Philippines. America’s future as a maritime power in the Asia-Pacific and the security guarantees to its allies—all of them concerned about China’s growing military might—is at stake. The U.S. sent a blunt but restrained message last week by sailing the USS Larsen, a guided missile destroyer, within 12 nautical miles of Subi Reef. The trajectory of this huge region could change, making the Pacific I love not so pacific in the future.